Tinnitus is a condition where the patient hears ringing, buzzing, or other sounds without an external cause. Patients may experience tinnitus in one or both ears or in the head. Tinnitus affects as many as 40 million adults in the United States. It is defined as either objective or subjective. In objective tinnitus, the doctor can hear the sounds as well as the patient. Objective tinnitus is typically caused by tumors, turbulent blood flow through malformed vessels, or by rhythmic muscular spasms. Most cases of tinnitus are subjective, which means that only the patient can hear the sounds. Subjective tinnitus is frequently associated with hearing loss and damage to the cochlea, or the inner ear. About 90% of patients have sensorineural hearing loss; 5% suffer from conductive hearing loss; and 5% have normal hearing. Diagnosis of tinnitus includes a physical examination of the patient’s head and neck. The doctor will use an instrument called an otoscope to examine the ears for wax, infection, or structural changes. He or she will also use a stethoscope to listen to the blood vessels in the neck. The patient’s doctor may also refer him or her to an audiologist, who is a health care professional trained to perform diagnostic testing of hearing problems. In some cases, tinnitus is a symptom of temporomandibular joint disorder, or TMJ, which is caused by dysfunction of the temporomandibular joint in the jaw. The muscles and nerves in the jaw are located very close to the nerves that control hearing, which is why TMJ can cause tinnitus. Patients with tinnitus may be referred to a dentist or orthodontist for assessment of their jaw muscles or a misaligned bite. The Rinne and Weber tests are commonly used to evaluate the type and severity of hearing loss. In the Weber test, the doctor holds a tuning fork against the patient’s forehead or front teeth. If the hearing loss is sensorineural, the sound radiates to the ear with better hearing; if the hearing loss is conductive, the sound will be louder in the damaged ear. In the Rinne test, the tuning fork is placed alternately on the mastoid bone, which is behind the ear, and then in front of the ear. In conductive hearing loss, bone conduction (BC) is greater than air conduction (AC). In sensorineural hearing loss, AC is greater than BC. Magnetic resonance angiography or venography (MRA and MRV) can be used to evaluate malformations of the blood vessels. Computed tomography scans (CT scans) or magnetic resonance imaging scans (MRIs) can be used to locate tumors or abnormalities of the brain stem. The doctor may order a complete blood count (CBC) with specific antibody tests to rule out syphilis or immune system disorders. Dietary adjustments, including the elimination of coffee and other stimulants, may be useful in treating tinnitus. In addition, reducing the amount of fat and cholesterol in the diet can help improve blood circulation to the ears. Nutritional supplementation with vitamin C, vitamin E, B vitamins, calcium, magnesium, potassium, and essential fatty acids is also recommended. In particular, zinc supplements have been recommended for patients diagnosed with tinnitus. A recent Turkish study has confirmed that older people whose diets have been deficient in zinc may benefit from supplements of this mineral as a treatment for tinnitus, but that younger patients eating well-balanced diets do not find that their symptoms improve when they take zinc supplements. Gingko biloba, an herbal extract, has been shown to decrease tinnitus symptoms in controlled animal studies and may be helpful in treating humans, since it is believed to enhance circulation to the brain in situations where reduced circulation is the cause. Individuals taking such blood thinners as coumadin or heparin should not take Ginkgo biloba, as the herb can interfere with platelet activating factor, the chemical that enables blood to clot. Acupuncture treatments may help decrease the level of tinnitus sounds the patient hears, and constitutional homeopathic treatment may also be effective. Some Chinese herbal treatments can be effective, as well. Tinnitus Retraining Therapy , or TRT, has been successful in treating some subjective tinnitus patients. This therapy is based on the assumption that the severity of tinnitus is determined not by the patient’s auditory system, but by the parts of the brain that control emotion (the limbic system) and body functions (autonomic nervous system). 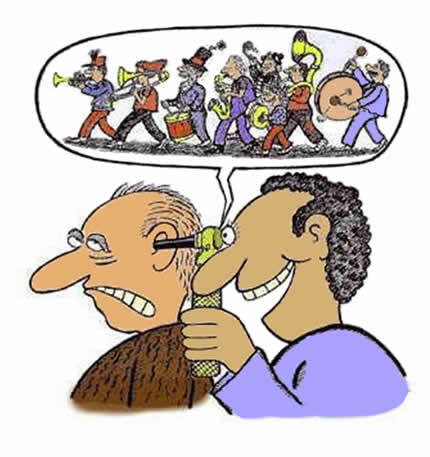 TRT focuses on habituating the patient to his or her tinnitus, retraining the brain to, in effect, “become used to” the tinnitus so that it does not perceive it as an annoyance. Some cases of tinnitus can be treated by removal of the underlying cause. These include surgical treatment of impacted ear wax, tumors, head injuries, or malformed blood vessels; discontinuance of ototoxic medications; and antibiotic treatment of infections. Patients whose tinnitus is related to TMJ usually experience improvement in or complete disappearance of the tinnitus when the dental problem is corrected. Subjective tinnitus, especially that associated with age-related hearing loss, can be treated with hearing aids, noise generators or other masking devices, biofeedback, antidepressant medications, or lifestyle modifications. One mainstream form of psychotherapy that is recommended to patients with tinnitus is cognitive-behavioral therapy, or CBT. CBT works by changing the patient’s emotional reaction to the tinnitus. The patient keeps a symptom diary and works on an individual basis with a counselor to identify negative thought patterns and behaviors related to the tinnitus and then changes them. The latest innovation in CBT for tinnitus is therapy via the Internet. According to a 2002 study by a group of Swedish researchers, 31% of patients who participated in a CBT program via the Internet reported significant relief from tinnitus at 1-year follow-up. The prognosis depends on the cause of the tinnitus and the patient’s emotional response. Most patients with subjective tinnitus do not find it seriously disturbing, but about 5% have strong negative feelings. These patients are frequently helped by instruction in relaxation techniques. Studies indicate that CBT is most effective as a treatment for tinnitus when it is combined with masking techniques or medication. One preventive measure is to wear earplugs when operating loud machinery or spending extended periods in such noisy environments as rock concerts. Prolonged exposure to noises of 90 decibels (about as loud as a running blender) or higher can cause permanent hearing loss and tinnitus. In some cases a change of occupation may be advisable; a recent British study found that as many as 266,000 men and 84,000 women in the United Kingdom between the ages of 35 and 64 suffer from tinnitus resulting from work-related noise. More detailed information and advice on dealing with tinnitus associated with noise-induced hearing loss is available from the National Institute on Deafness and Communication Disorders (NIDCD), listed under Resources below.